Sometimes a girl just needs a mid-summer wedding road trip! My excuse was Blake and Anastasia’s wedding at the magnificent Pine River Ranch in Leavenworth. So, early on July 23rd, I got in the car and started driving over I-90 to Leavenworth. I arrived early and after a bit of walking around the town, I made my way out to the Pine River Ranch. If I could clone Blake and Anastasia, I would do it. 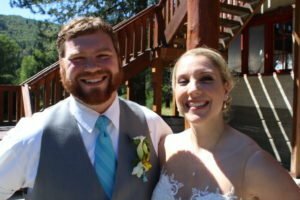 These two are an Officiant’s dream couple – fun-loving, easy-going, gracious and focused on what is important on a wedding day. Anastasia was just beautitful and her boots (which complemented her gown beautifully) made me smile! We had a lovely ceremony outside under a flowered arbor. Yes, it was hot and happily, all went very well. I drove off with a happy feeling in my heart, knowing these two were brought together for all the right reasons.